Musky Innovations Seducer: This awesome 9” hard plastic “Walk the dog” top water is easy to work, incorporates rattles which is rare in top waters, finished in five holographic designs, has 3-dimensional eyes and is a must for large game fish. 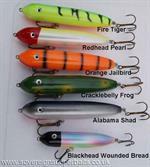 Heavier than most “Walk the dog” top water lures it rides low in the water so hooks up very well. If you are into big lures this one will not disappoint.